Netanyahu will ask government to approve release of 104 terrorist murderers who have been in jail for 20 years. In advance of the resumption of “peace talks” between Israel and the Palestinian Authority (PA), Prime Minister Binyamin Netanyahu has agreed to release 104 terrorist murderers who committed their terrorist crimes before the signing of the Oslo accords in 2003. The number is up from the previously discussed number of 82. The decision will be brought to the government for approval in the weekly cabinet session on Sunday. 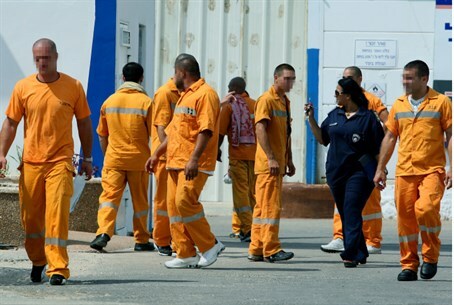 The terrorists to be released from captivity will include Israeli citizens. The list of names will be approved by Netanyahu, Defense Minister Moshe Yaalon and Justice Minister Tzipi Livni. "This is a tremendously difficult decision to make,” Netanyahu said in a statement he released Saturday night. “It hurts the bereaved families, it hurts the entire nation of Israel and it hurts me very much. It collides with an exceedingly important value – the value of justice. It is a clear injustice when evil people are released before the end of their sentences, even if an absolute majority among them have served over 20 years in jail. The terrorists are to be freed as an Israeli "gesture" prior to the resumption of "peace talks" with the PA. Israel has made such "gestures" before previous rounds of talks, which never achieved anything. The PA is never required to carry out "gestures" to Israel, however. Other Israeli "gestures," in the past, have included the lifting of security checkpoints in Judea and Samaria, which was always followed by a rise in terrorist activity in the areas affected, as well as the freezing of construction of homes for Jews in the ancient Jewish homeland of Judea and Samaria. The name "Jew" comes from the name "Judea," which is the Roman version of the name Yehuda.